The best tennis ball machines will be able to create a random stream of patterns, firing the tennis ball anywhere on the court to test your reaction speed and ability to control your strike. 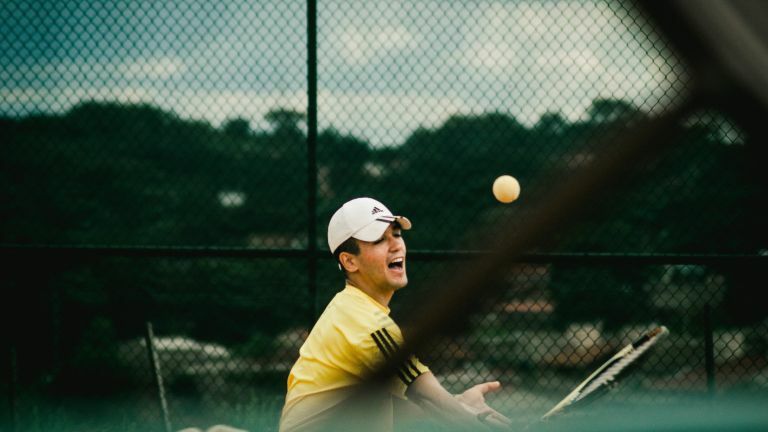 They’re a great shout if you’re serious about your game and want to practice but your tennis partner isn’t always available. Tennis ball machines are all about moving you around the court. They don’t come cheap (the best ones will set you back about two grand or so), but the more expensive they are, generally speaking the better they are. For example, our top pick, the Spinfire PRO 2 holds up to 800 balls so you can forget refilling every five seconds, while the 20-80 mph firing range and horizontal and vertical oscillation means it’ll really test your positioning, reaction and aim. If you want to save yourself £700 or so, you can always go for the Spinshot Plus, although as expected, you’ll have to make some compromises. Make yourself work as hard as you like with the Spinfire Pro. With horizontal and vertical oscillation capabilities, you can practice hitting shots to the front, back, left and right side of the court and because it’s only the internal workings of the machine that oscillate, the shots remain unpredictable. You can use these functions separately or together and you can switch up the speed to increase or decrease difficulty. With plenty of controls to help you design your own practice section, this is well worth the spend for serious tennis players. Suitable for beginners up to advanced tennis players, this tennis ball machine offers plenty of scope to practice. With a lower speed range of 10-70mph, complete beginners will be able to familiarise themselves with slower shots, while more advanced players will be able to combine its full horizontal oscillation and 70mph speed limit to really taste their range around the court. The wheeled base combined with the 2-4 hour battery life makes this machine super-easy to transport to and from the court, so there’s no excuse not to practice! If you’re finding it hard to justify the price of our first tennis ball machine, we think this one may be a good compromise. Although it doesn’t hold as many balls and the speed range isn’t quite so large, when it comes to what matters – play time and oscillation – this machine is right up there with our top pick. It offers players randomised oscillation so you never know where it’s going to fire the ball and there’s plenty of controls so you can design your practice session around your ability. While it may be heavier than our other picks, it’s earned itself plenty of five star reviews, making it a great compromise. While its little brother, the Lobster Elite Freedom is perfect for beginners, this one boasts a few other bonus features that make it the ideal tennis ball machine for intermediates and experts. With the option to fire the balls with backspin to test you on the rebound shot to the random oscillation so you can’t quite predict where on the pitch it’s going to fire the ball, for an extra £100 you can guarantee yourself a more testing and varied practice session, while still benefiting from a decent battery life and speed range. If you’re willing to compromise on the amount of balls it holds and the amount of play time that it offers, this tennis ball machine is a great compromise for our first pick. You still have the freedom to create your own practice sessions, with the option to control the height and length of the fired shots. Boasting heaps of five star reviews, plenty of happy players sing its praises, with portability, functionality and flexibility is its key selling points.